Its late afternoon and I am sat in my post van overlooking the summer isles on a dull but wonderful day, the soft white light illuminating a monochrome sandstone beach, I am elated that the only bright green area of the beach is actually a colony of seaweed rather than a ‘colony’ of washed up cut plastic netting. Altandu beach is the beach that 18 months ago shocked me into taking my work into a new direction and which is now changing my life style, as I begin to work and live (for part of the year) out of a post van along the Scottish coastline. 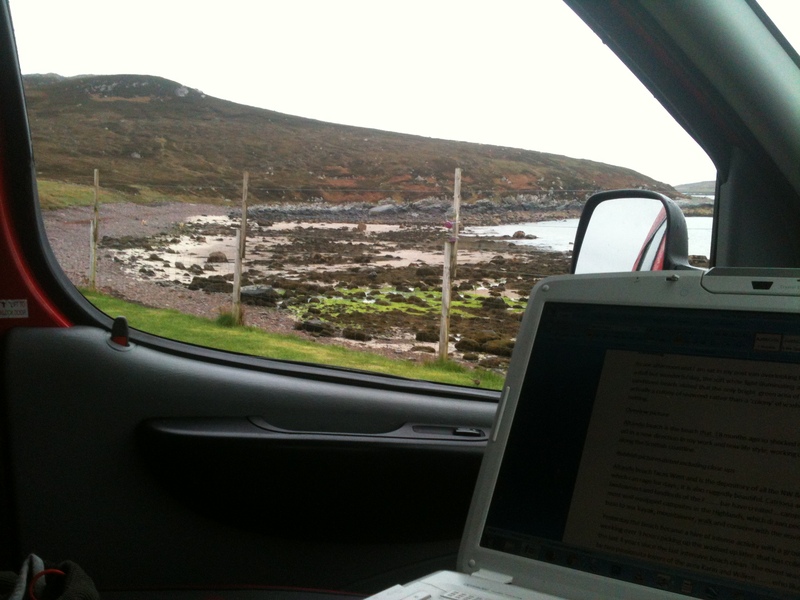 Its late afternoon and I am sat in my post van overlooking the summer isles on a dull but wonderful day, the soft white light illuminating a monochrome sandstone beach, I am elated that the only bright green area of the beach is actually a colony of seaweed rather than a ‘colony’ of washed up cut plastic netting. Altandhu beach faces West and is the depository of all the NW & SW storms , which can rage for days , it is stunningly ruggedly beautiful. 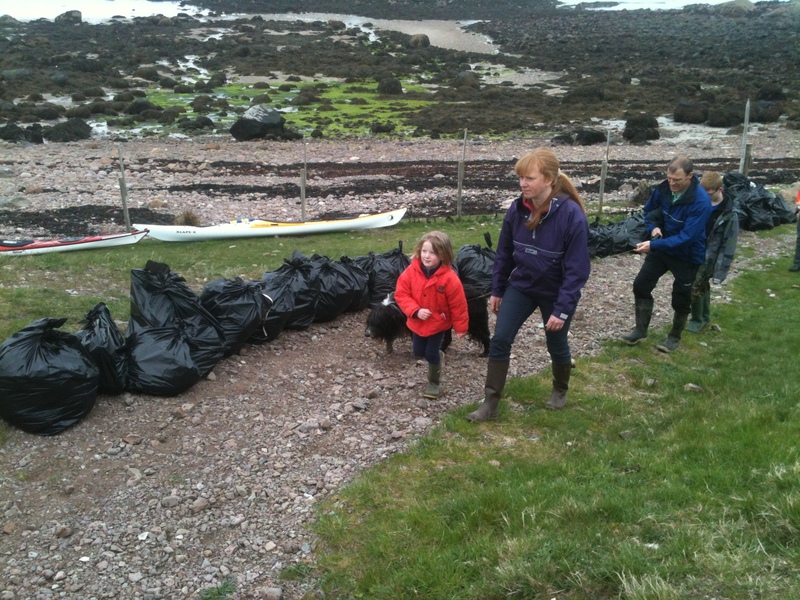 Catriona and David the landowners and landlords of the Am Fuaran Bar have created Port a Bhaigh campsite one of the most well equipped campsites in the Highlands, which draws people to it for a base to sea kayak, mountaineer, walk and convene with the environment. 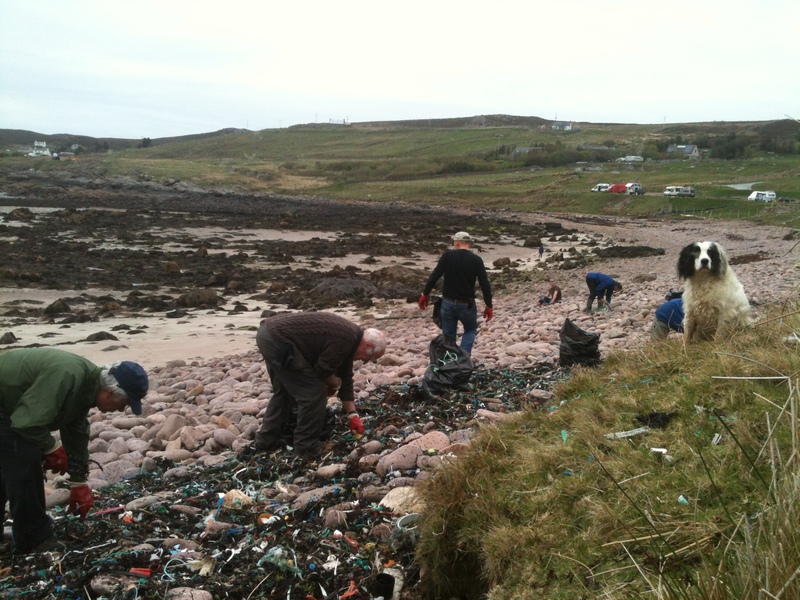 Yesterday the beach became a hive of intense activity with a group of people working over 3 hours picking up the washed up litter that has collected over the last 4 years since the last intensive beach clean. The event was organised by two passionate lovers of the area Karin and Willem Meyer who like me have been aware of the mounting rubbish at Altandu over the last few years. Their call for help brought in 20 volunteers throughout the afternoon, each person working in their own way some heading for big pipes, boxes , tangled masses of ropes others painstaking picking out hundreds of small pieces of rope and nets cut on trawlers and washed overboard. Comments from the volunteers (mostly campers) varied alternately from exclaiming about the never ending pieces of cord and rope within a small area to the great satisfaction at seeing bags filling up. A good feeling but a familiar chilling message especially when counting and weighing the bags. 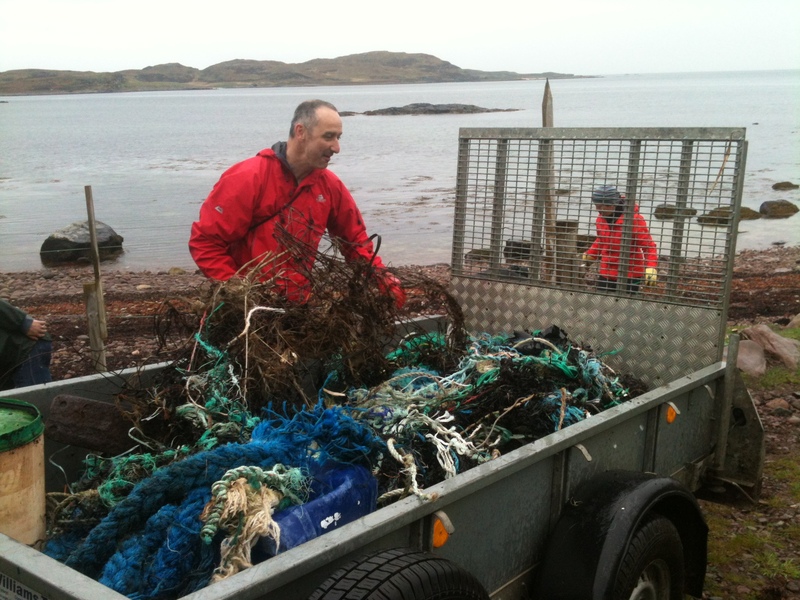 110 bags were filled and 2 trailer loads of heavy rope, wire and piping was collected from approximately 300m of the beach we cleaned. This morning my weighing session revealed that we had collected approximately 320kg per 100m. 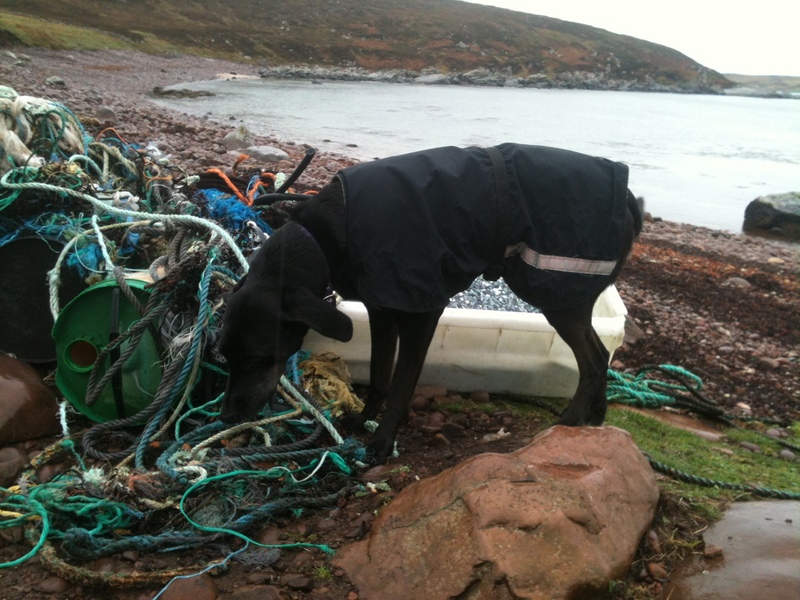 A chilling statistic especially when knowing that over 90% of this litter came specifically from the trawlers fishing in the area and wider area of the Minch . 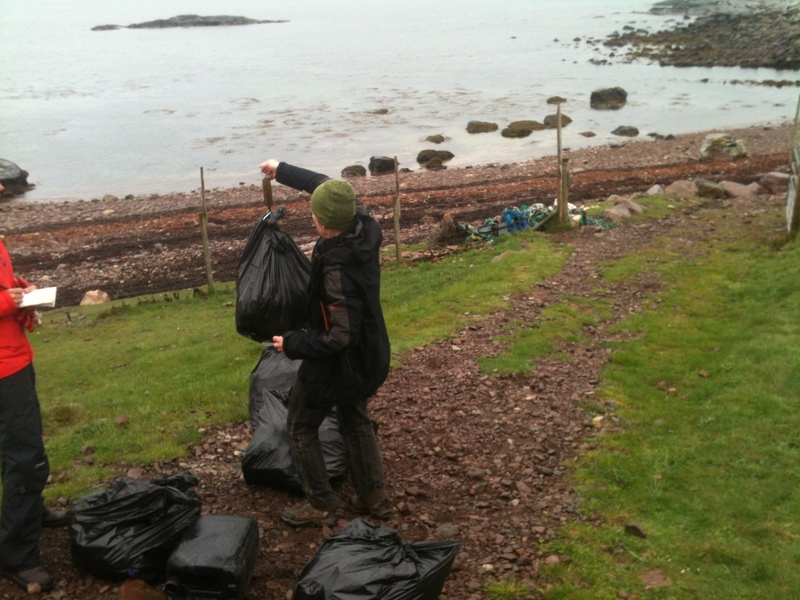 While it will take years to change the practices on boats that are responsible for beach litter in the area, through instigating tighter legislation and employing more enforcement officers (there is only one at present for the whole coastline of Scotland) the power of volunteers is heartening . 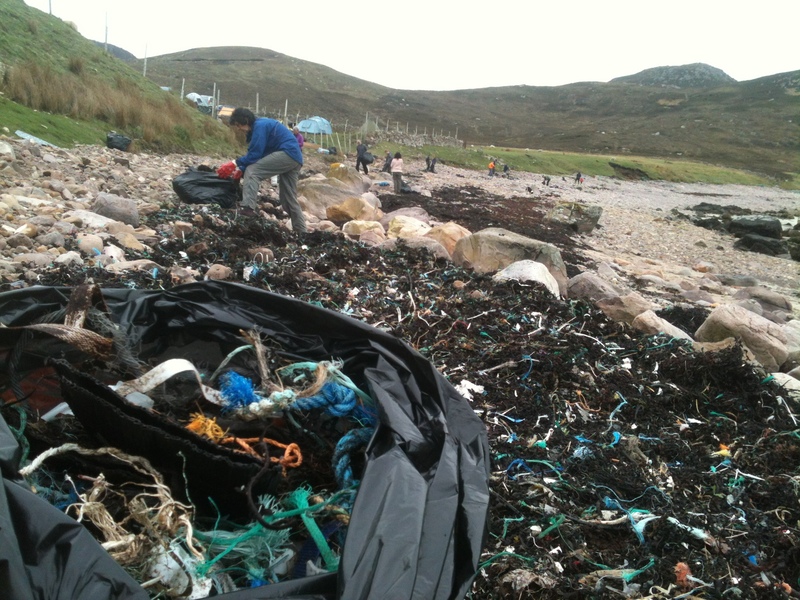 A keen group of us last night and this morning mulled over what we can do to help keep this beach clean and I suggested an idea to make and install a ‘measuring cylinder’ which beach users could deposit small pieces of rubbish collected on the beaches, inspired by the fishing line bins I have seen along the Dorset coast. The campsite owners are happy to install the ‘measuring cylinder’. So over the next few weeks I will be sketching out the idea, with the hope of raising money to make the first prototype to install here later in the summer.